Prepare to have your breath taken and your jaw dropped by the Chinese State Circus! The internationally acclaimed Circus returns to the UK after a break of three years, returning to its roots in an innovatively spectacular new production – ‘Dynasty’. This exhilarating, colourful and entertaining show is packed with spectacular acrobatics and incredible stunts. The Chinese State Circus will perform at The Apex on 10 November; the 7.30pm performance has already sold out, so a second show has been added at 5pm. Set to a soaring musical score accompanied by the rhythmic beats of Chinese percussion, over 2000 years of artistry and music combine in an incredible performance suitable for all the family. Thirty world-class Chinese acrobats, aerial artistes and jugglers will interact with the super-human physical skills and dexterity of the legendary Shaolin Warriors - the masters of martial arts. Thrill follows thrill in the nonstop action, from start to awesome finale: Hurtling porcelain jars... dynamically spinning plates... gigantic pyramids of tables and chairs… the delicate strands of silk supporting cascading aerialists. Thrill at the consummate skill of these all-human performers (yes, even the dragons!) on their exhilarating journey through Chinese culture. Please note – there are NO scary clowns, in this production! The Chinese State Circus is at The Apex on Thursday 10 November at 5pm. 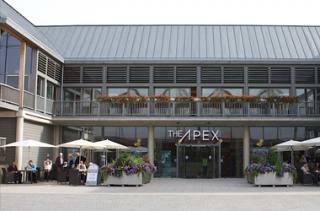 Prices are £25 (£23 concessions), £10 for children and £59 for a family ticket; ring the box office on 01284 758000 or see the website - www.theapex.co.uk - for details.